Racine Brewing Company started up in late 2017, brewing beer and craft sodas right along Main Street. Husband and wife team Andy & Angie Molina, Racine residents all their lives, always loved craft beer and traveled around to tour many across Wisconsin and nearby states. Inspired by what they saw and the benefits for the community that develop with it, they decided to brew their own craft beer in Racine. The tap room offers their regular and seasonal brews along with occasional guests from other brewers in Wisconsin and Illinois. At various times, Racine Brewing’s Tap Room features live music, a comedy show, karaoke, or game nights. Their Facebook page has more event details. 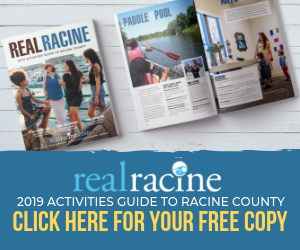 You’ll find Racine Brewing Company in a storefront on Main along the strip in Racine’s downtown, right along Highway 32. Highway 20 is just to the south by a few blocks; Highway 38 is just a few blocks to the north. Highway 11 also brings you into Racine a mile or two to the south.